Photos by, clockwise from top left: Jennifer Walker, Sarein Basi-Primeau, Kelsey Collins, and Cody Gold. The photo at bottom left shows coonstripe shrimp apparently attacking a moon jelly (Aurelia labiata) on a piling. The coonstripe shrimp is translucent orange-red to brownish-red. Its tail (abdomen) is marked by irregular reddish-brownish stripes with a diagonal orientation slanting down towards the tail; its body is marked by thin white lines, and small white and red spots. Small electric blue spots sometimes dot the tail and body. The end of the tail (telson) bears six pairs of spines forming two lines. This shrimp species reaches 15 cm long. 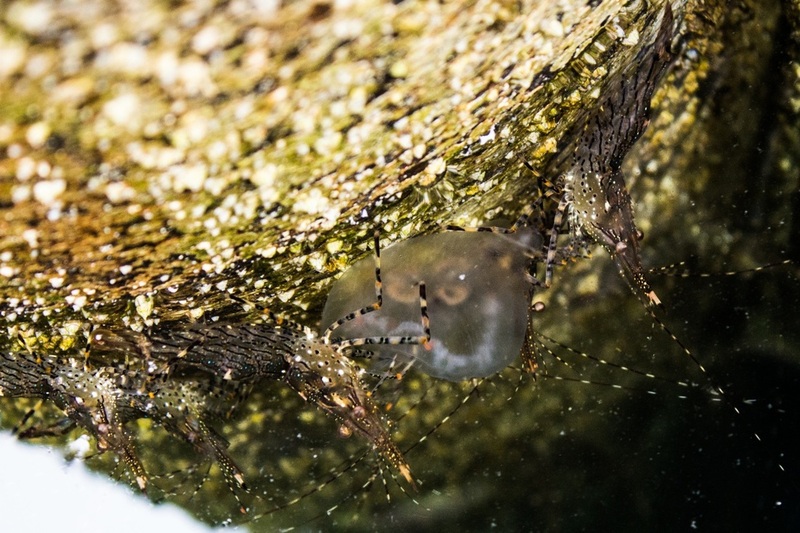 This species is often seen on pilings and docks; it also inhabits rocky and sandy ocean floors to a depth of approximately 200 m or more. Adults tend to stay in the subtidal, while juveniles may be found in shallower areas. Its range extends from northern Alaska to northern Mexico. 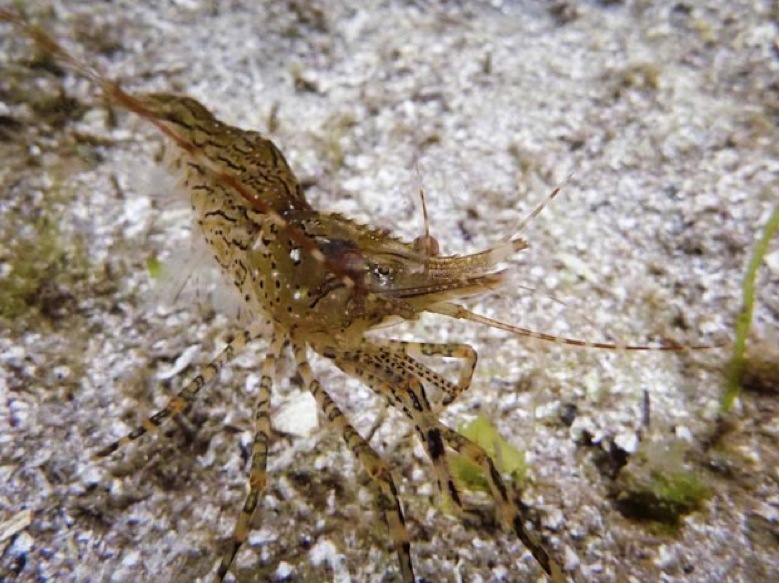 The irregular reddish-brown diagonal stripes on the tail are a key identifying feature of the coonstripe shrimp; the rough patch shrimp (Pandalus stenolepus) also has electric blue spots and spines on its telson (3-5 pairs), but lacks the same diagonal stripes and is less translucent. 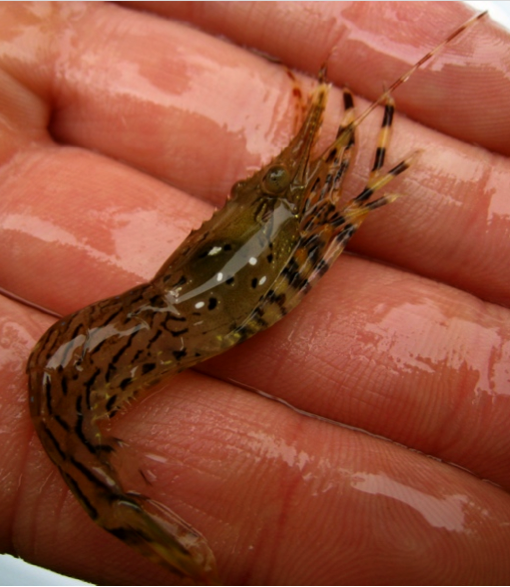 Another species, P. hypsinotus, is also commonly called coonstripe (or coonstriped) shrimp - which can lead to some confusion. This species is harvested by recreation and commercial fisheries, and may appear in hauled-in crab traps. Cowles, D. (2005). Pandalus danae Stimpson, 1857. Invertebrates of the Salish Sea. Rosario Beach Marine Laboratory. Accessed 29/09/2014. Harbo, R. M. (2011). Whelks to whales: Coastal marine life of the Pacific Northwest. Madeira Park, BC: Harbour Publishing. P. 109. Lamb, A., and Hanby, B. (2005). Marine Life of the Pacific Northwest [electronic resource]. Madeira Park, BC: Harbour Publishing.